The first time I met Susanna, I heard her before I saw her. It was my senior year of high school, and this tiny little freshman got up to audition for the musical...her voice was already SO AMAZING, and her belt carried throughout the theatre. Luckily we were in the musical and choir together, and I grew to adore the girl as much as I adored her singing voice! She moved to New York to pursue her acting career, and I ended up in LA and Phoenix, building my photography business. Through the magic of facebook I got to watch her meet Graham, and build their lives together. I was BEYOND THRILLED when she called me to see if I could photograph their destination wedding in Las Vegas. Graham & Susanna are opposites on the surface, he is reserved, she is more outgoing, but inside they are goofs who love a good drink, love some good food (Graham is a chef at a nationally known restaurant), and had one of the most fun weddings I have ever had the pleasure to be a part of. Buckle Up, people, this is going to knock the wind out of you!! I was hanging out with the girls at their suite at The Cosmopolitan on the strip. We had a perfect view of the fountains at the Bellagio and the view was simply awesome!! 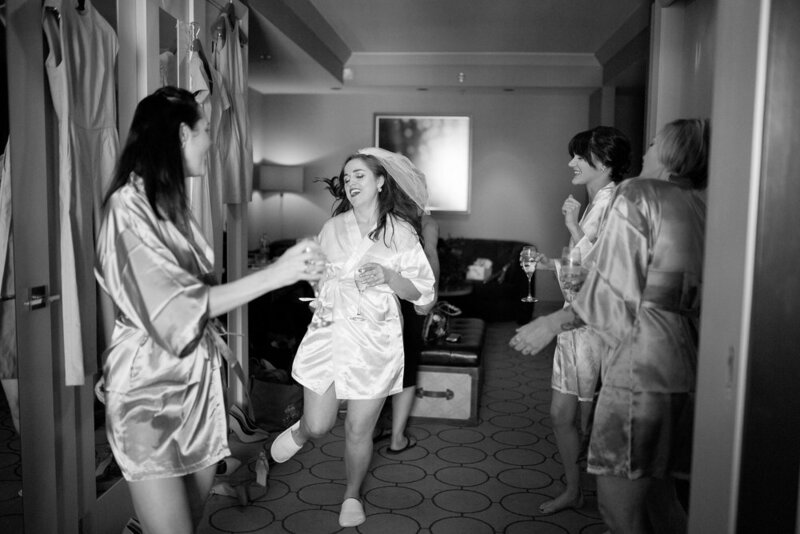 Susanna made all the proper preparations for her wedding day, shaved legs and champagne ;-). Before Susanna got into ther dress, it was of course time for a DANCE PARTY!! Each of the girls took their turn shakin' it. It was one of the most fun getting ready moments I have ever witnessed. As I was on the main strip with the girls, Phil was with Graham and his groomsmen hanging out at the Downtown Grand in their very RED suite. I think they had a few good laughs together, and a few good whiskies ;-). It's never too late to complete those vows! Then it was time for their first look on the balcony of their hotel room. Susanna had given Graham a secret message to read before he turned around, but she was super ready for him!! I think hte look on his face when he saw her says it all... soooooo much love there. It's really beautiful. Time for the entire wedding party to get in on the action! We had a few fun spots in Vegas scoped out for portraits, and I am going to go ahead and say this wedding party NAILED IT. Susanna's bridesmaid Shana styled all the bridesmaids in dresses from her brand, In God We Trust, NYC. They looked AMAZING together, and I especially loved when they tied it all together with the blue suede shoes! We were in Vegas, after all!! Susanna had found a photo from another wedding of a bride and groom at this pink motel. She sent it to me saying "We HAVE to find this place". Well, here at Erin Evangeline Photography we love nothing more than to make dreams come true, so I found the motel, and we made a few amazing, sun-drenched photos. Thank god for sunglasses in the desert, and adorable brides and grooms who are willing to play along with crazy ideas! We headed back to the Downtown Grand Hotel, for some fun, quirky photos on the pool deck. Susanna and Graham love Wes Anderson, and we were going for a colorful, 70's vibe. We decided to be very immersive in the environment, shoot with people in the background, and just enjoy the fun of being all dressed up on a pool deck in Las Vegas. I LOVE these photos. I love when a couple has so much vision and are so willing to play on their wedding day. TOTALLY worth it! It was WEDDING TIME!! Graham and Susanna were legally married last year in a ceremony that her mother was able to witness before she passed away. Susanna's dad, who is a preacher, married them at that small ceremony. 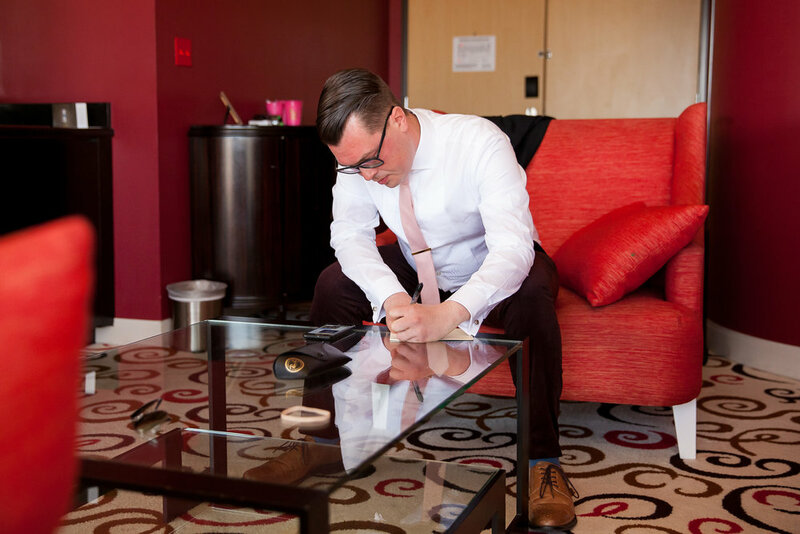 Susanna had always dreamed for her dad to walk her down the aisle at her wedding, so when they were planning this ceremony for family and friends in Vegas, her brother stepped in as officiant and her dad was able to walk his only girl down the aisle to her love. She wore a veil that her sister in law made in the fashion of her mother's veil. I'm not sure there was a dry eye in the house at that moment. Both Graham's parents were able to attend the ceremony in Vegas, and you could feel all the love in the space coming from all the family and friends finally celebrating these two together. It was beautiful. Mr and Mrs!!! That sun was intense, but I think Susanna's smile just might be outshining it! With that, it was time to play in the Neon Boneyard for a bit. The first request of our bride and groom was for a photo with the sign to remind them to their home! NY NY!! DREAM... I think this is my favorite of the day... WHAT A DREAM!! Can we please also talk about Graham's amazing velvet suit. ON POINT FRIEND! Fun fact, the Downtown Grand Hotel used to be the Lady Luck. Since Graham and Susanna's wedding reception was there, I made sure we got a Wes Anderson inspired photo of them with the Lady Luck sign. Congratulations, Graham and Susanna. I am so honored and lucky to have been a part of your wedding day. Your love for each other is so evident in everything that you do, and I can't wait to see where the future takes you! Have a great time in Zion on your mini-honeymoon and let's meet up next time Phil and I are in New York! !